So the Mac has managed to blow me away again today, almost as much as when I first started using it, about this time last year. How you might ask? Well I found out today that you can create custom keyboard shortcuts. As a self confessed keyboard lover (I love shortcuts and desktop launchers, like Alfred ), I really missed some of the keyboard shortcuts in Mail that others such as Sparrow and Postbox have, such as the ⌘ + Enter shortcut key to send email. This was a complete pain to me (turns out the default Mail one is Shift + ⌘ + D which to me doesn’t seem right). 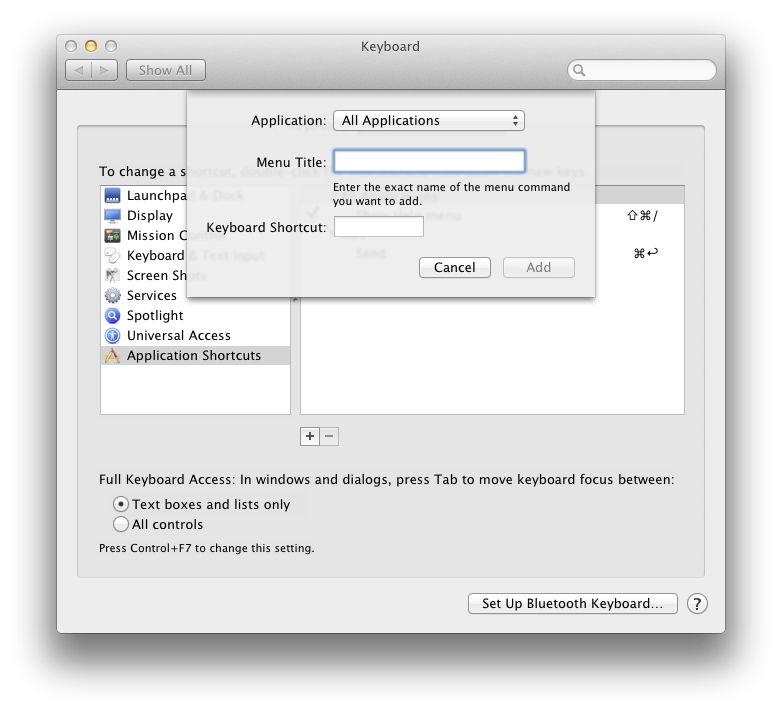 Anyhow, it appears that with Mac, you can create shortcut keys for any application or remap them to whatever you want! It’s all done in System Preferences, using the Keyboard option. On opening, select the Keyboard Shortcuts option and select Application Shortcuts. Clicking the + sign lets you choose what you want to add as shown below. This lets you add whatever you want just by putting in the name of the menu item you want to change/add a shortcut for, so I added the ⌘ + Enter key that I wanted and when I restarted Mail.app, it was there ready for me to use (it looks like if the application was running, the application needs to be restarted for it to be picked up properly). The fact that you can do this for any app blows me away somewhat – I don’t think Windows has anything like this (or at least, not so eaisly accessed and changed) which means that this is another of those features that Mac has that make it better for the user than Windows!